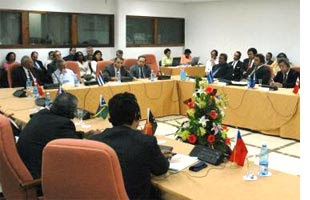 HAVANA, Cuba, Sept 17 Cuba and 10 island-states of the Pacific region strengthened their cooperation and friendship ties after the conclusion in Havana on Tuesday of the First Bilateral Ministerial Meeting that took place at the Palco hotel. After urging participants to speak as a bloc in all international forums, Lelemia praised the strength with which Cuba faces the economic, financial and trade blockade imposed by successive US administrations for almost half a century. He added that the island-states of the Pacific region support the UN resolution that, for the past 16 years, has condemned this blockade and has demanded its immediate end. For his part, Cuban Foreign Minister Felipe Perez Roque stressed that, although all the countries of the South face similar threats and challenges, it is the small developing island-states the ones that suffer the most when faced by negative phenomena such as climate change and the world food crisis. “Cuba is a country that is under an economic blockade and which does not have financial resources to share with you. However, we offer you our most valuable treasure: our human capital,” Perez Roque said. Participants in the event agreed to hold the second meeting of this kind in 2011 in Havana and also to hold a meeting of Foreign Ministers next year in the venue of the United Nations in New York. They also agreed to create a working group to monitor the implementation of the main agreements of this first meeting. Also on Tuesday, Perez Roque held bilateral meetings with the foreign ministers of Nauru, Salomon Islands and Fiji Islands. The event was also attended by the President of Kiribati, Anote Tong, and official representatives from Tonga, Vanuatu, Samoa, Micronesia and Papua New-Guinea.